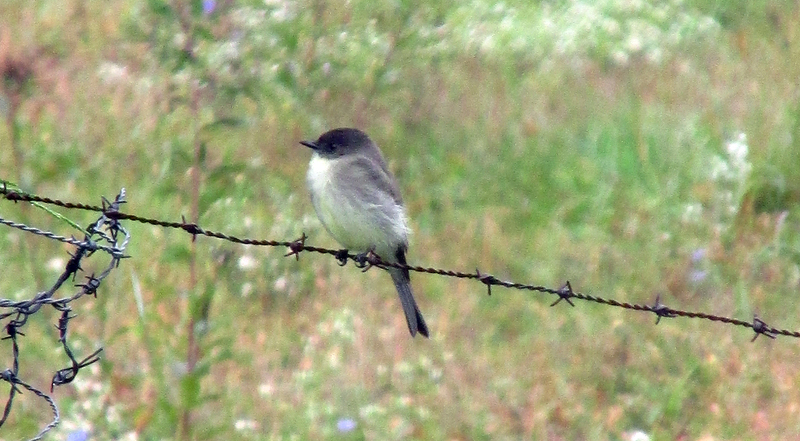 Photo by Bryan Stevens An Eastern Phoebe perched on a barbed wire fence. The end of October punctuates the annual spectacle of fall migration. By the end of the month, most of the summer residents — hummingbirds, vireos, tanagers, warblers —will have migrated out of the region to distant wintering grounds. In the waning days of October, winter residents — Brown Creepers, Winter Wrens, Dark-eyed Juncos, Hermit Thrushes and much more — take up residence in our yards, where they will keep a low profile during the fewer hours of daylight during the long winter months. So far, I have already welcomed a Marsh Wren and Winter Wren to my yard, and I am looking forward to the arrival of winter sparrows. I have once again been leading bird walks every Saturday in October at Sycamore Shoals State Historic Park in Elizabethton. There are still two walks — Oct. 24 and Oct. 31 — for interested persons to attend and try to get a look at some of the late-fall migrants passing through the region. The walks begin at 8 a.m. Bring binoculars to increase your viewing enjoyment. Photo by Bryan Stevens One of the lingering Ruby-throated Hummingbirds perches in branches near a hanging feeder. The first two walks were cancelled due to rain, but on a very chilly morning on Oct. 18 the first walk finally commenced. Five participants joined me for a morning stroll on the park trails and along the Watauga River. We saw Wood Ducks, Mallards and Canada Geese, as well as several flocks of Cedar Waxwings, along with Blue-headed Vireo, Yellow-rumped Warbler and several woodpeckers, including Downy, Red-bellied, Pileated, Northern Flicker and Yellow-bellied Sapsucker. At home, the seasons are definitely shifting. Although a few Ruby-throated Hummingbirds lingered (as of Oct. 18), the first White-throated Sparrow put in an appearance on Oct. 14. Winter residents are gradually displacing departing summer visitors. Last year’s bird walks at Sycamore Shoals produced some good birds, including a female Common Merganser that was discovered in the Watauga River. Other good finds have been found in past years. On Sunday, Oct. 11, my mother and I enjoyed watching a female Common Merganser on the Watauga River. Photo by Bryan Stevens A Common Merganser on the Watauga River associated with Canada Geese and Mallards. For many years, the Common Merganser was one of my target birds. Finally, more than 10 years ago, I saw my first Common Mergansers during a visit to Middlebrook Lake in Bristol with Reece Jamerson, Gil Derouen and the late Howard Langridge. Despite the word “common” in its name, this merganser isn’t particularly common in Northeast Tennessee. Its relatives, Hooded Merganser and Red-breasted Merganser, are much more regular visitors to the region. Photo by U.S. Fish & Wildlife Service A male Common Merganser takes a swim. The Common Merganser, particularly the males, are easily identified. Apart from their large size, which is about 26 inches long for males, males of this duck have a dark green head and upper neck. The lower neck, breast and underparts are creamy-white with a varying amounts of a pink or reddish wash. The back is black, while the bill, legs and feet are red. Females are similar to female Red-breasted Mergansers but show a clearly defined white chin patch lacking in their close relative. According to the website Ducks Unlimited, Common Mergansers breed from Alaska, the southern Yukon, Labrador and Newfoundland south to central California, Arizona, New Mexico, southern Chihuahua and east of the Rockies to Minnesota, Michigan, New York, New England and Nova Scotia. 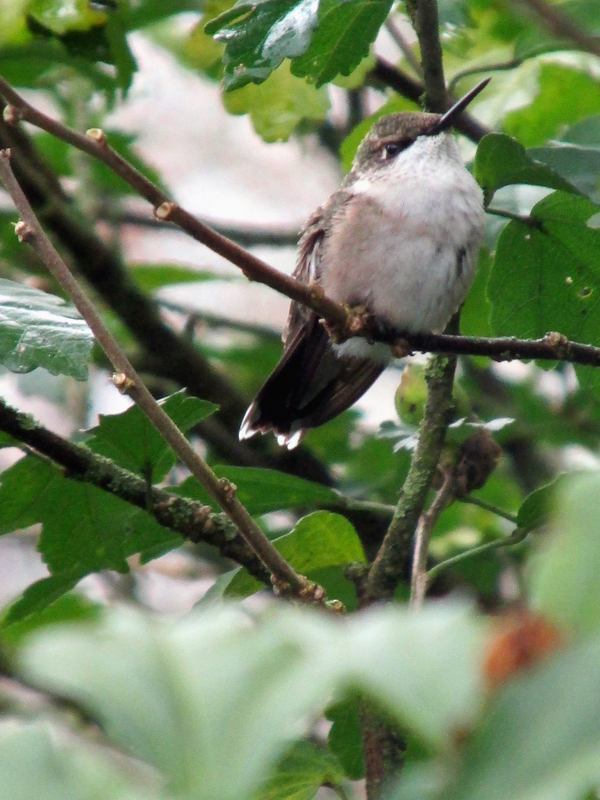 They are also one of the biggest of North America’s cavity-nesting birds, utilizing natural cavities in trees, as well as man-made nesting boxes. They will also nest on the ground. Common Mergansers feed mainly on fish, amphibians, crustaceans, mollusks and other aquatic organisms. 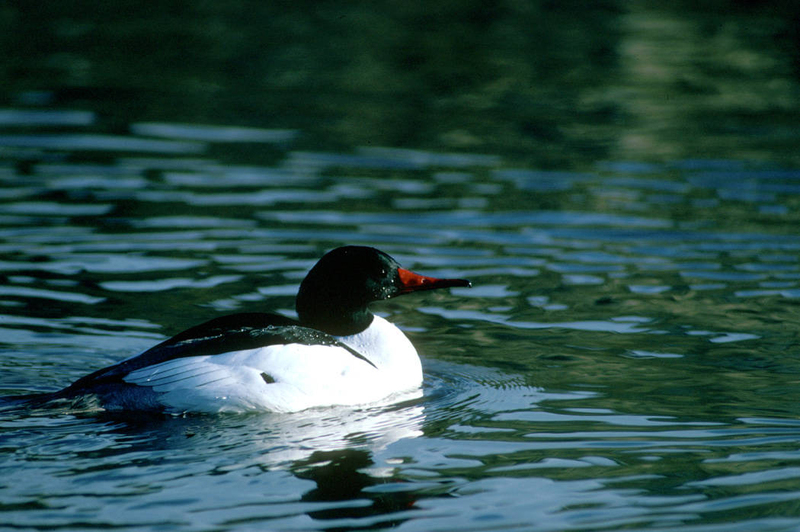 The last extensive population surveys of Common Mergansers took place during the 1970s, when the population in North America was estimated at 1.5 million birds. May population surveys during 1970-’79, suggested a continental population of 1.5 million birds. Population tracking has been lacking in recent decades, but experts believe that Common Mergansers have a stable population. Photo by Bryan Stevens A Common Yellowthroat hides in a tangle of brush during a migration stop. When November arrives, I’ll be keeping watch for ducks making stops at the pond at Erwin Fishery Park or along the series of ponds located along the linear walking trail in Erwin. I’ll also make a journey to Wilbur Lake, one of my favorite destinations, to look for returning Buffleheads. To learn more about birds and other topics from the natural world, “friend” Bryan on Facebook at https://www.facebook.com/ahoodedwarbler. He is always posting about local birds, wildlife, flowers, insects and much more. 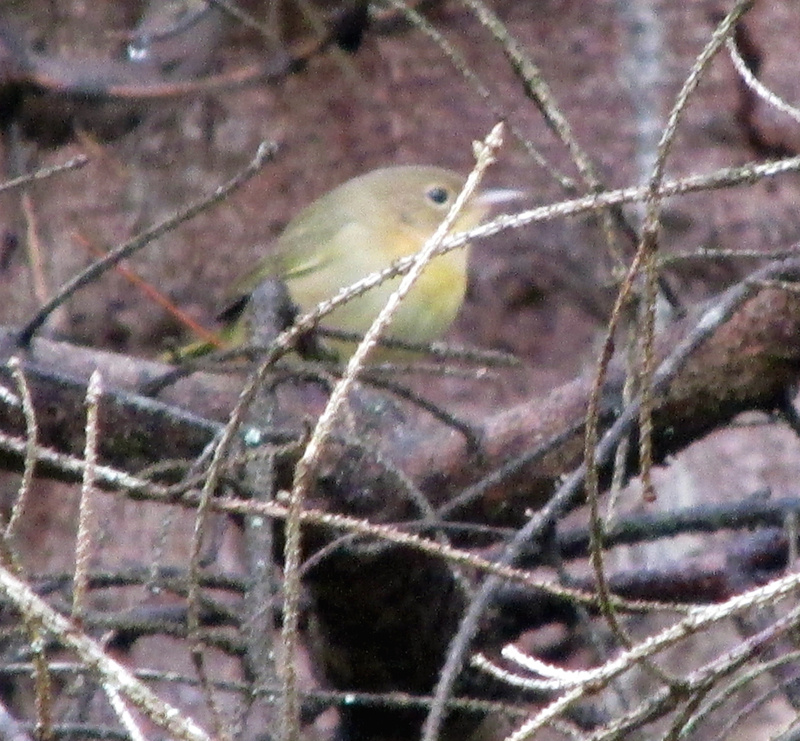 If you have a question, wish to make a comment or share a sighting, email ahoodedwarbler@aol.com. 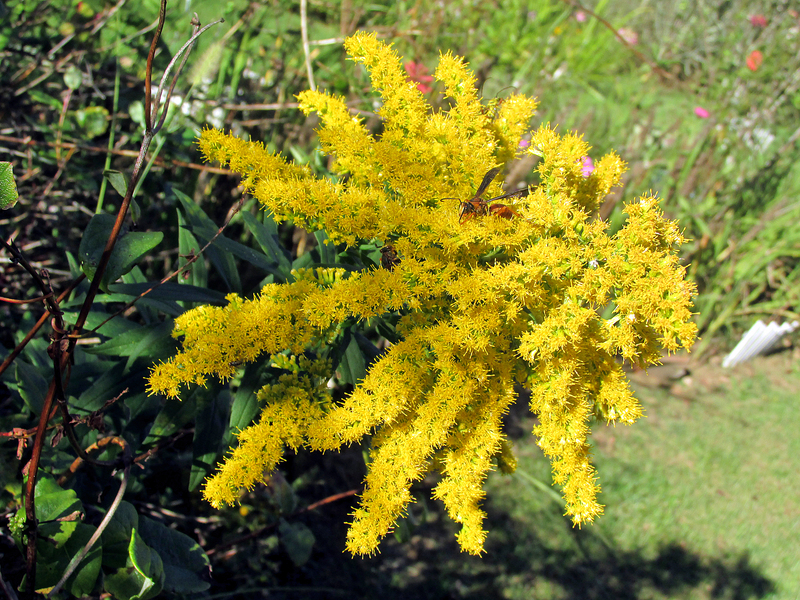 Photo by Bryan Stevens Blooming Goldenrod looks splendid in fall sunshine. 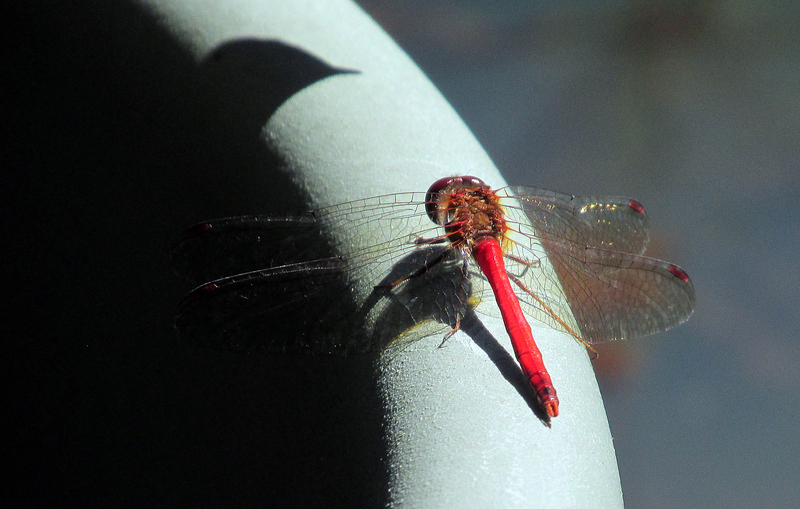 Photo by Bryan Stevens The Autumn Meadowhawk, pictured, and Shadow Darners are some of the final dragonflies flying around the fish pond as cooler weather arrives. 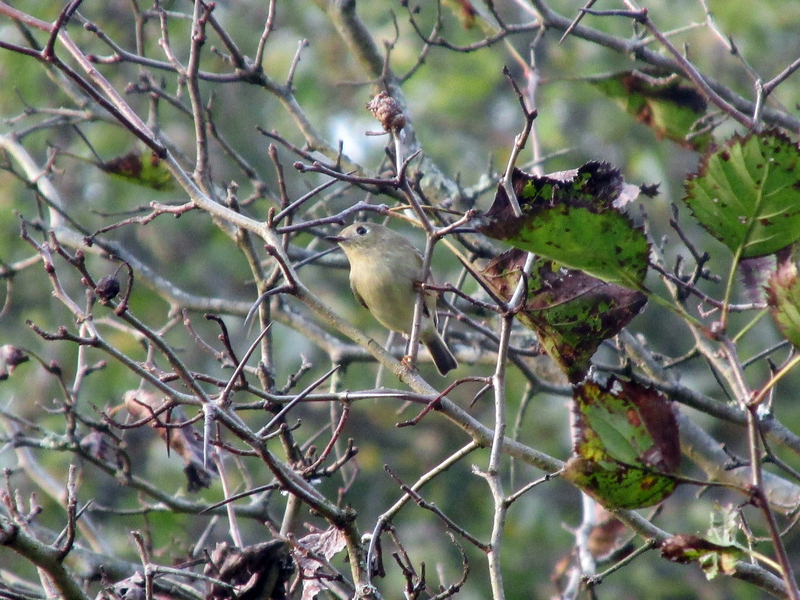 Photo by Bryan Stevens Some Ruby-crowned Kinglets, such as this individual, may overwinter in Northeast Tennessee. This entry was posted in Birding, Birds, Mergansers and tagged Birding, birds, Bristol Herald Courier, Bryan Stevens, Carter County Compass, Elizabethton Star, Erwin Record, Fall migration, Feathered Friends, McDowell News, Merganser, Our Fine Feathered Friends, Ruby-throated Hummingbird, The Erwin Record on October 18, 2015 by Bryan Stevens.